This offseason, we introduced PFF’s new advanced quarterback charting data, featuring an entirely new way of evaluating the game’s most important position. 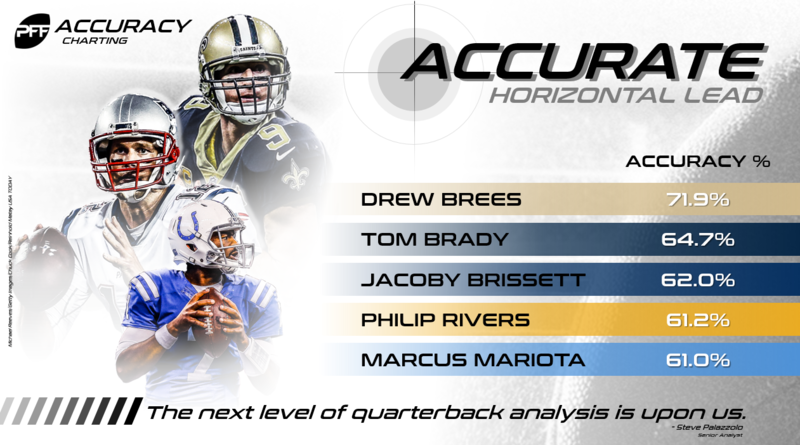 While the QB Annual and PFF Draft Guide are the best place to start for a broad overview of each NFL quarterback’s advanced accuracy, I’ll be taking you through an in-depth breakdown of our data points throughout the spring and summer. First, be sure to read the overview of our process, and it’s always nice to have this image handy when going through the data. Today’s focus is overall accuracy on different throw types, including “accuracy plus” which is our way of identifying “perfect” throws. We’ve broken down the quarterbacks by pass depth and separation, but now it’s time to look at individual throw types. We sorted each throw type into a number of different buckets but will focus on the most common: horizontal leads, vertical leads, over the shoulders and stick throws. Horizontal leads are passes in which the quarterback is trying to lead the receiver horizontally across the field (think slants, crossers). Vertical leads are passes in which the quarterback is trying to lead the receiver vertically up the field (think posts, seams). Over-the-shoulder throws are just as they say, passes in which the quarterback is trying to drop the ball over a receiver’s shoulder with touch (think “go” routes). Finally, “stick” throws are passes in which the quarterback is firing the ball on a line with the receiver either facing him or working back toward the throw (think curls and comebacks). Remember: this is all about actual ball location of the pass, not just throwing a “catchable” pass. 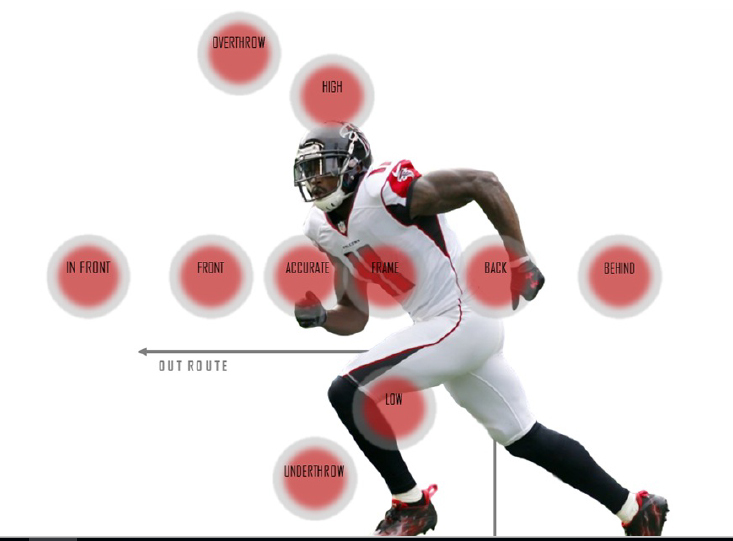 We’ve proven the importance of ball location with regard to yards after the catch and expected points added, so putting the ball in the right spot is crucial in order to optimize success.